All this said, it’s somewhat ironic that Mai Grille —one of the most forward-thinking restaurants on the Big Island — is located on a golf course in a resort. Inside the simple and clean, hardwood-laced clubhouse, Chef Hess experiments with native ingredients and gastronomic techniques to make creative, casual cuisine that proves to tourists and locals alike that there’s more going on in Kona than pork chops. According to Hess, Hawaiian food is a hybrid of cultural influences, fused together by the many culinary heritages brought to the islands from places spanning from Germany to China to Japan through the imports of labor. Hawaiian culture is still a plantation culture. Farms on estates, growing cash crops like coffee, stud the winding roads that overlook lush valleys and the Pacific coastline. Hess says that one of the great tragedies of the food industry on this island that teems with fresh fruits, wild pigs, grass fed cattle, and perennial greens is that an estimated 90 percent of all produce is imported from thousands of miles away. Hess calls Mai Grille, “The House of Bacon” — or The Bacon Hale in Hawaiian. Hess is passionate about bacon, and he’s certainly not alone. Inside Mai Grille’s kitchen walk-in are multiple Cambros with 85 lbs. of bacon curing in each plastic container. He sells his bacon at farmer’s markets around the region, and incorporates it into many of the dishes on his menu. 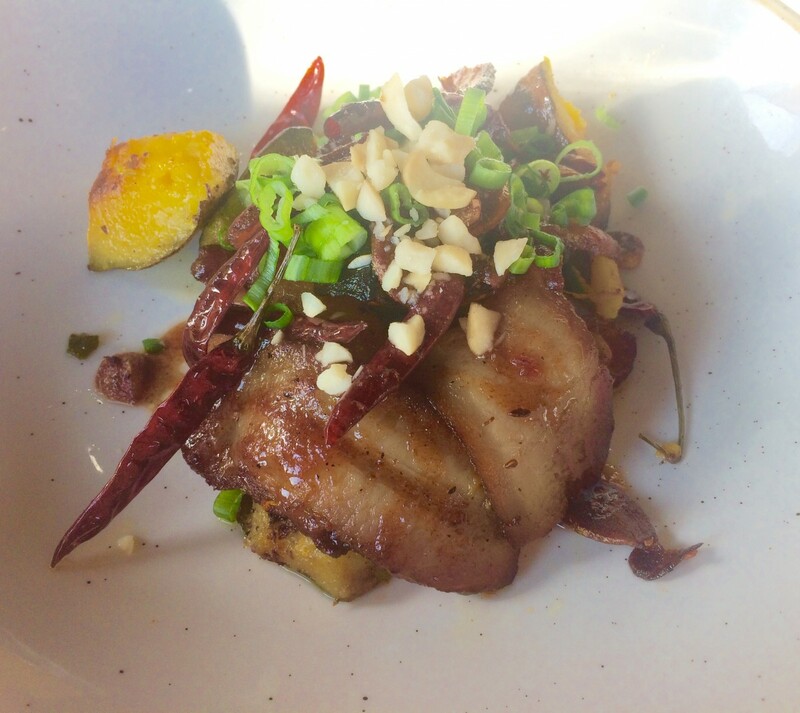 Our personal favorite is the wok-fried bacon with roasted kobocha squash that comes sizzling in the oil of chile de arbol and is topped with crushed macadamia nuts, scallions, fried garlic, and a sweet tomato coffee-based glaze made from beans from Hess’s coffee farm. The burger is ground with 20 percent bacon and 80 percent chuck from farm-raised cattle that graze on open pastures in the Waimea region. Hess also likes to use Asian-based ingredients as a way to explore the myriad of cultural influences present on these islands. Why use semolina flour when there are so many other types available? He makes shrimp chips with tapioca flour. 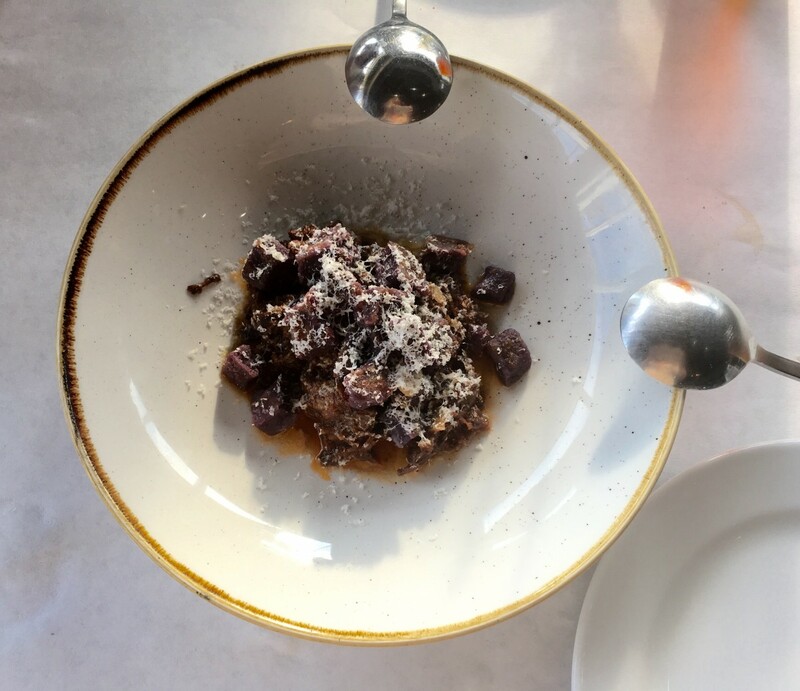 His gnocchi is made with potato starch, and then paired with beef shank (aged in-house), purple sweet potatoes, and grated Big Island goat cheese. He double wraps and fries the rice paper in his asparagus and goat cheese summer roll so that the textures resemble mochi and then finishes it with a nitro truffle oil. Exotic island greens are used in all the salads — mustard, sorrel, and mizuna lettuce. The beet salad is a best seller. And since nothing Hess makes is ordinary, neither is this. He accents it with li hing mui — a salty, dry, pickled plum powder that he makes into a jelly using agar — as well as edible flowers like pansies and more of that local goat cheese. He buys his fish directly from local fisherman. On the dinner menu, customers can order a 3 to 5 lb. whole fish that is roasted on the bone. Wash it down with a glass of beer from Big Island Brewery like the Red Sea of Cacao — a dark brew made with cacao fruit and red sea salt. Part of his pioneering involves transparency. 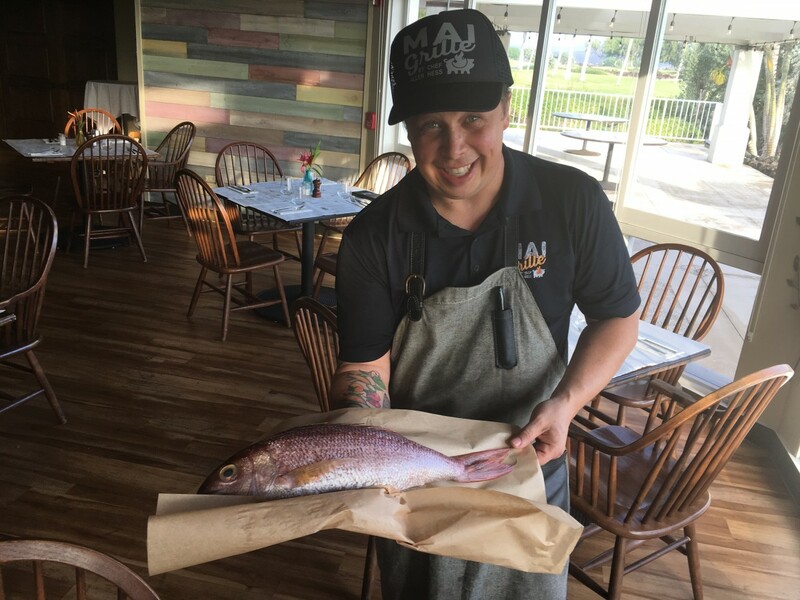 If you go to the Mai Grille website, you’ll see a section called “Weekly Nightmare,” where Hess divulges the worst scenario that transpired behind-the-scenes in the kitchen. He does this as a way to explain himself in a crowdsourced culture filled with Yelp reviewers. 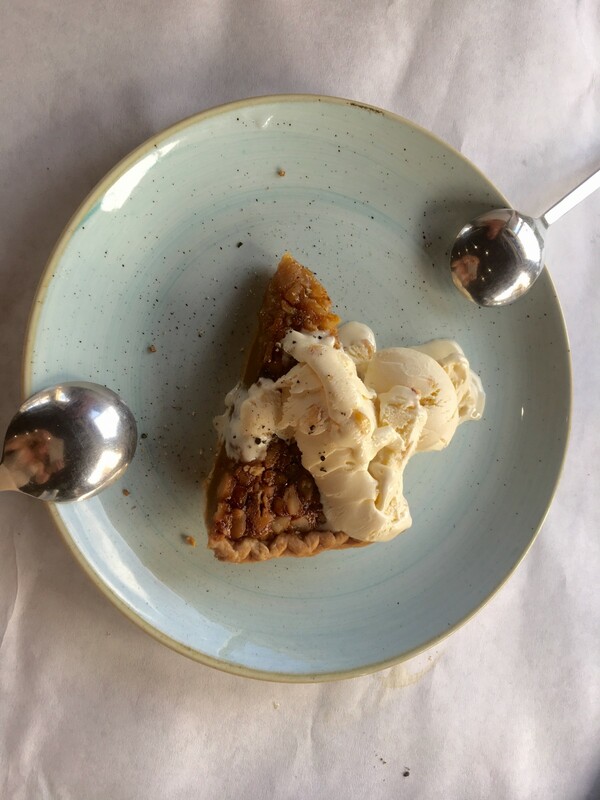 When a chef truly takes pride in what they do and always strives to improve as Hess does, there’s usually a reason why service isn’t seamless, and it often has nothing to do with the quality of ingredients used or the composition of the dishes. It’s the shipment that arrives late on the day of a 200 person banquet, or the employee who pulls a no call, no show after failing to finish the evening prep list. The average customer is divorced from what kitchen life is actually like, and some don’t have compassion when there’s a glitch in all the moving parts that need to coordinate to make a restaurant run. The Weekly Nightmare is Hess’s platform to educate others about all this. There's a lively juxtaposition present at Mai Grille — of the refined and the childlike, the innovative and the informal. A picture of a slider being putted by a golf club adorns the multi-colored stained wood walls, along with quotes like: “I’m known to eat expensive lunches from the farm right to the table,” “Give me some hot macaroni and cheese! Give me some more please,” and alliterative rhymes from the rap group Blackalicious. The menu is printed with scrawly fonts resembling a kid with a crayon, and yet Hess finishes his farm-to-table food with elevated gastronomic techniques, like dust from dehydrated fruits and vegetables and soy lecithin bubbles. His kitchen is at once experimental and unassuming, homegrown and full of finesse.